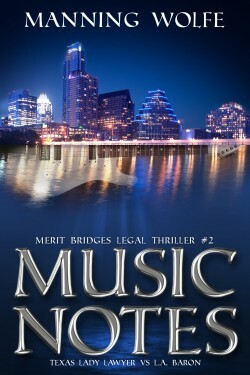 Attorney Merit Bridges finds herself in danger again in Music Notes: Texas Lady Lawyer vs L.A. Baron. When client Liam Nolan is slain with his own guitar, Davey Ray Bell shows up claiming to be the celebrity musician’s illegitimate son. L.A. Baron, Nolan’s former manager, makes a back-door music deal and tries to grab the estate for himself. When the probate court pushes Baron out of the picture, he goes after Merit with a vengeance. Using the dark web, he ruins her reputation, destroys her career, and finally attempts to kill her. Who will top the scales of music and the scales of justice?